How much does it cost to travel Indonesia? In this guide, we’ll go over the cost of traveling Indonesia, look at Indonesia hotel prices and accommodation budgets, lay out our best tip for finding cheap hostels and hotels in Indonesia, and help you choose the most applicable Indonesia budget to suit your travel style. Note: This Indonesia Travel Costs Guide includes affiliate links. That means Go Backpacking might get a small commission if you click through to purchase or price something out. Don’t worry, it’s nothing extra for you, and helps support this site. Indonesia is a huge country that is made up of a massive archipelago of over 17,000 islands. Each island offers an incredible natural environment and a diversity of cultures, traditions and ethnic groups. In a country where you are able to relax on pristine islands, see Orangutans in the wild, climb volcanoes, and visit ancient historical sites, the cost of travel in Indonesia ensures it will continue to be a good deal for budget travelers. Things are changing as the government tries to increase tourism in the country. Currently, for most countries, including USA, Canada, Australia,and the UK, can get a 30 daynon-extendable stamp, free of charge, or pay $35US, for a “Visa on Arrival” which can be extended by 30 days if you wish. Once you land, you will choose either the “Visa Free” line, or the “Visa on Arrival” line, depending on what you want. Accommodation in general is quite affordable, if not outright cheap! Hostels are set up more as guest houses, it's often easier to find double rooms than dorm beds. Some double rooms come en-suite, while other have communal bathroom facilities. Guest houses in the major cities or tourist areas, like Jakarta or Bali, have inflated room prices but prices are still decent. As an example, along with a friend, I paid 50,000 IDR ($3.75), 25,000 ($1.90) each for a double room in the city of Medan, Sumatra, but on the beautiful shores of Lake Toba we only paid 30,000 IDR ($2.25) for a double room. At first thought, it almost seemed outrageous when the cheapest guest house we could find in Jakarta was 70,000 IDR ($5.25) per night, but then I realized it wasn't too much when split by two. Accommodation prices in Bali or the popular tourist oriented islands of Indonesia are generally slightly more pricey. (2017 Update: obviously prices have changed since writing this post, so we've updated all current listings below). A step above the cheapest rooms, that come with air conditioning can cost around 100,000 – 200,000 IDR ($7.50 – $15.00) per night. All the popular hotel and hostel search sites (Booking.com, Agoda, Hostelworld, etc) have lots of accommodation options in Indonesia. We recommend you start your search with Hotels Combined. Hotels Combined is a meta-aggregator. It compares the other main booking sites to find the best price, then lets you book with that site (like (Booking.com, Agoda, etc). As it doesn't include Hostelworld, you need to check that site separately. Take a look at the sample comparison search we did for CX Hostel Kuta Raya in Kuta on Bali. The first image shows the search results on Hotels Combined — $7 per night for a dorm. The second search shows the search results on HostelWorld — $9.03 per night for a dorm which is almost 30% more expensive. What about when you actually click through to book? Some search aggregators add on “fees and taxes” which can bring the price back up. So when we clicked through to book, we found the final price to be $7.83 which is still 15% cheaper than Hostelworld. How Much Can You Actually Save Using HotelsCombined? We get down to specific prices in our Sample Indonesia Accommodation Budget below where we've tried to give an educated estimate about the savings you can expect by using HotelsCombined. By our estimate, a 2-week trip through Indonesia will cost you between $94.50 and $331.00, depending on your travel style (cheap, to on a budget, to flashpacker). If we assume using HotelsCombined will save you about 15% on your accommodation budget, that’s savings of between $16.00 (a free night in Indonesia) and $57.00 (that kind of money goes a long way in Indonesia, perhaps an organized excursion!). We think that’s worth it for less than 5 minutes of effort! We priced this out based on 3 different travel styles: “On the Cheap” (dorms beds as cheap as possible), “Upscale Budget” (bunks in ‘boutique style’ hostels), “Affordable Flashpacker” (private rooms in boutique and luxury hostels, or 3-star level hotels). Of course, prices are based on the time of writing and will vary depending on the season and how far in advance you book, etc. 3 Nights in Bali – ($9.00 – $24.00) The cheapest place in Bali is undoubtedly Ubud, where a bunk can be had for about $3.00 at a well liked place like Hostel Rama Sita. Kuta is known for it’s parties and wild nightlife and is closer to the airport, if this is more your style, stay at CX Hostel Kuta Raya for about $8 per night, or Camp Hostel Bali for $5 a night. 2 Nights Surabaya – ($10.00 – $18.00) The Hostel Surabaya has bunks in mixed dorms for about $9 per night. On the uber cheap, Da Rifi Hostel has bunks for about $7.50 per night, but we were able to find a deal on Hotels Combined for about $5 including breakfast. 2 Nights Yogyakarta – ($10.00) A bunk in a mixed dorm at Rumah Panjaitan goes for about $5 per night, breakfast included, well located, and highly rated. 3 Nights Jakarta – ($21.00 – $24.00) We found deals in Jakarta for bunks starting at about $7 a night at Teduh Hostel Kota Tua, and $8 a night at Wonderloft Hostel. 1 Night Medan – ($6.50) Probably just a night after flying from Jakarta on your way to Lake Toba region, so head to Pondok Wisata Angel Guest House with bunks starting at about $6.50 per night. 3 Nights Lake Toba – ($18.00) You can find a room a Laster Jony’s for about $6 a night for a budget double room with private bathroom. It’s located on Samosir Island on the lake and past guests have raved about the location. 1 Night Jakarta – ($14.00) Obviously you can stay at the same place you did on the way through, or you can spend a bit more and stay closer to the airport, check out RedDoorz and get a room for about $14.00. 3 Nights in Bali – ($18.00 – $30.00) A night in a mixed dorm at a well liked place like Bread and Jam goes for about $9.00 per night, or head to Canggu Surf Hostel for about $10 per night. 2 Nights Surabaya – ($16.00 – $19.00) Ikiru to Live Hotel is well rated, and has 3-bed dorms for $9.50 a night, or a more traditional hostel dorm can be had at Krowi Inn from about $8.00 per bunk, per night. 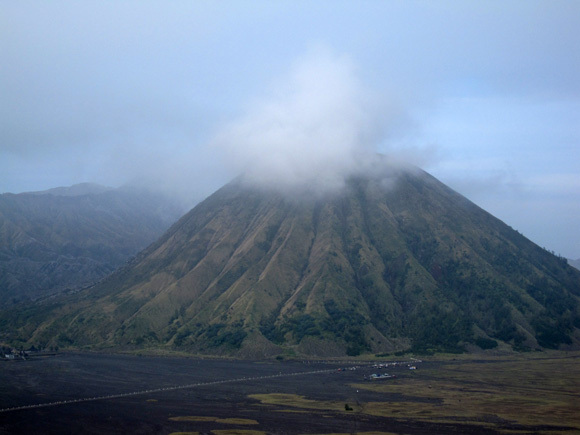 2 Nights Yogyakarta – ($14.00) Find a quiet place like MashBrow, which is more of a budget hotel than a hostel. It’s away from the center, but closer to the temples, and have motor bikes for rent. Rooms for about $7.00 a night. If you want to be in the city center, try a place like Bunk Bed and Breakfast for about $7.00 per bunk per night. 3 Nights Jakarta – ($24.00) A bunk or a capsule can be had a the Packer Lodge, or Six Degrees, both are highly rated, for about $8.00 per night. Jakarta is massive, so play around with Hotels Combined because depending on your dates, there are insane deals to be had. 1 Night Medan – ($7.50) A decent night can be had at K77 Guest House for about $7.50 per night. Lot’s of local spots nearby for food and drinks. 3 Nights Lake Toba – ($24.00 – $45.00) Nothing beats Laster Jony’s for price and atmosphere, and they have multiple room options. A deluxe double can be had for $8.00 a night. 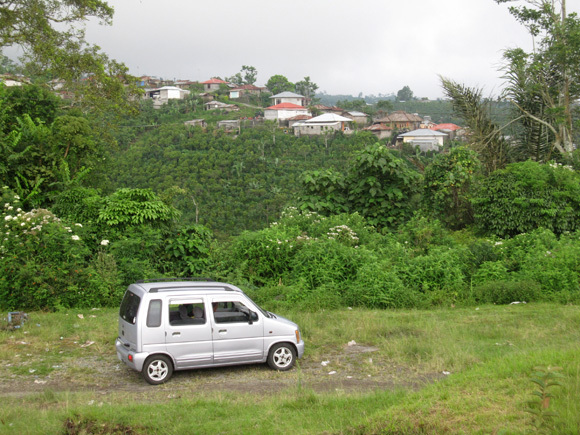 If you are looking for serenity and nature, Toba Cats Garden may be your place, $10.00 per night. For those who want a little more atmosphere, check out Tuk Tuk Sarapan $15.00 per night. 1 Night Jakarta – ($20.00) D’Prima Hotel Airport has rooms for about $20.00 but we were able to find better on Hotels Combined. Free airport shuttle, toiletries, a/c, bottled water and a coffee and pastry in the morning to get you on your way. 3 Nights in Bali – ($51.00 – $57.00) If you’re heading to Ubud, Indraprastha Ubud Home Stay has private rooms from $17.00 per night. Mote Surfstay in Canggu is a top choice if you’re heading there, for $18.00 per night, or if you’re staying near Kuta, Bread & Jam has private rooms (it’s still a top/bottom bunk) for $19.00. 2 Nights Surabaya – ($36.00 – $40.00) As with the upscale budget options above, Krowi Inn and Ikiru to Live Hotel are the best options, depending on your dates, Hotels Combined has both with private rooms from $18.00 – $20.00 per night, and it includes breakfast. 2 Nights Yogyakarta – ($18.00 – 24.00) The highly rated OstiC House has privates from $18.00 per night with breakfast included. For a bit extra ($24.00), Jogja Dreams Bed and Breakfast has very high reviews on multiple sites. Family run, clean, peaceful and comfortable and located in a quiet neighborhood, but still close to the center. And, of course, breakfast is included. 3 Nights Jakarta – ($51.00) Get a private room at Wonderloft Hostel for $17.00 a night. There is a small supermarket on-site, shared kitchen and breakfast is included. This hostel gets sparking reviews, past guests have loved the vibe, felt very safe in the clean and modern facility, excellent staff, lots of games, and loads of restaurants and shopping nearby. 1 Night Medan – ($19.00 – $25.00) Many travellers simply stay the night in Medan before heading out to the Lake Toba in the morning. If that’s the case for you, Grand Sakura Hotel for about $25 a night is very close to the train station, which is also where the Rail Link train from the airport arrives. As with the upscale budget options, K77 will suit your purpose as well, privates there from about $19.00 per night. 3 Nights Lake Toba – ($60.00 – $105.00) Cottages a little away from the town can be had a Mas Cottages for about $20 per night. Closer to the town, Samosir Villa has a nice pool and breakfast is included for about $35.00 a night. 1 Night Jakarta – ($25.00 – $29.00) D’Prima is a good option here as well. Also, POP! Hotel Airport is a super cool looking joint, $29 gets you a basic double room with breakfast, (a bit less if you don’t want, or don’t have time for breakfast). This is where Hotels Combined can definitely come in handy as we found great deals at higher end hotels in and around the airport for about the same price, but it depends on your dates, of course. Street food in Indonesia is a great value. Simple single plate meals or noodles cost anywhere from 7,500 – 23,000 IDR ($0.57 – $1.72), while a giant plate of food with all kinds of assorted side dishes (nasi campur) costs 23,000 – 31,000 IDR ($1.72 – $2.30). Eating street style fulfilling meals like entire grilled fish and fancier dishes can cost in the range of 38,000 – 53,500 IDR ($2.87 – $4) per person. 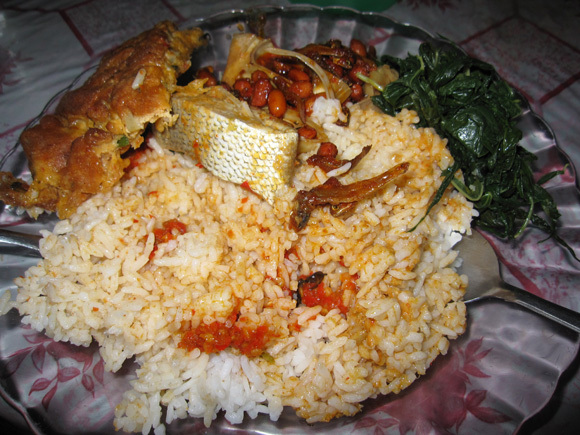 Indonesian sit-down restaurants are priced in the 31,000 – 76,500 IDR ($2.30 – $5.74) realm. If you eat at more Western style food chains or fancier restaurants, meals can cost 76,500 – 153,000 IDR ($5.74 – $11.48). Large 1.5 liter bottle of water goes for 4000 – 8000 IDR ($0.30 – $0.60). In relation to cost of living and eating in Indonesia, drinking and going out is relatively expensive. Local beer such as Bintang, at cheap convenience stores costs 18,000 – 35,000 IDR ($1.35 – $2.60). At bars or clubs, drinks can go for 35,000 – 77,000 IDR ($2.60 – $5.74). Some upper class or nightclubs that cater to tourists charge cover. Indonesia, as a chain of islands, sometimes presents a challenge when it comes to transportation. For getting from major island to island, there is a choice of ferry or flight. Indonesian style buses navigate the streets, but roads are often in poor conditions. Trying to get from Medan, Sumatra to Jakarta on the island of Java, there was a choice of bus and ferry combination, or taking a flight. The journey by road would have taken 4 days and the flight about 2 hours. With only a 1 month visa for Indonesia, I scooped up an Air Asia flight for 688,937 IDR ($51.66). Or, check on Skyscanner, as Indonesia has some domestic airlines that cost about $50US or less between Jakarta and Medan, and about $40US Jakarta to Bali. On the island of Java, the train is a great transportation option. Economy class overnight train from Jakarta to Yogyakarta cost me 110,000 IDR ($8.25). I also took the train from Yogyakarta to Surabaya for 65,000 IDR ($4.90). If train is not available, bus is the only option left. I took a 12 hour, very nice bus from Cemoro Lawang (Mount Bromo) to Probolinggo, Java and across a ferry to Denpasar, Bali at the cost of 165,000 IDR ($12.40). Within cities, there is the possibility of taking local buses, tuk tuks, rickshaws, or renting your own motorcycle or car. At Lake Toba, I rented a motorcycle for a day for about 60,000 IDR ($6.89) including petrol (update: current price is closer to 100,000 IDR, about $7.50). In Bali, a few friends and I rented a micro Suzuki SUV that cost 200,000 IDR ($22.96) for 24 hours (current 186,500 IDR, $14.00US). It can be worth it to be able to go anywhere on your own time. Want to bundle some meals, accommodation + tours? Book one of these G adventures trips! 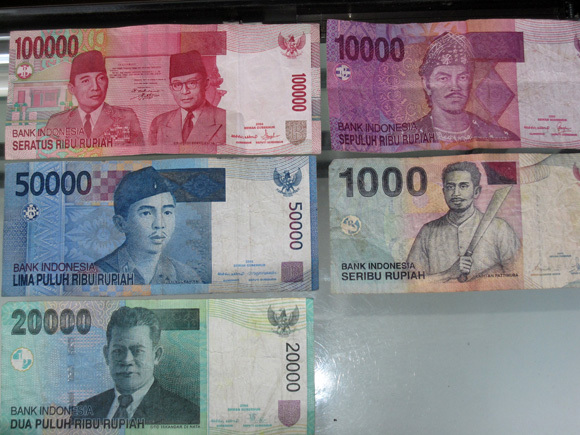 Upon leaving Indonesia, there is a departure tax of 150,000 IDR ($17.22). UPDATE: as of 2015, departure tax is now included in your ticket price! For my total month of traveling in Indonesia, I spent a total of about $18 USD per day. This included a plane flight, quite a lot of transportation, a lot of food, and all the attractions I wanted to see including the expensive Orangutan trek. I did save a bit of money by not drinking often and by couchsurfing for free about 1/3 of the time. Interested in Couchsurfing? Sign up for free here. If you stay at accommodation with air condition and party many nights, the cost of traveling in Indonesia might hover from $25 – $30 per day. If you go super tight on the budget, you can get by in Indonesia for even $15 per day.